The YCDSB’s Equity Office identifies inequities and develops system-wide strategies to bring about equity, justice and harmony in a Christ-centered learning and working environment. 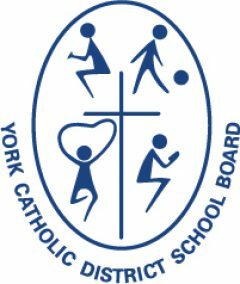 The poster was created in order to show how the York Catholic District School Board sees its role within the Regional Municipality of York’s Character initiative. The York Region Character Council has representation from the YCDSB which oversees this initiative. The notion of Character has played a significant role in Catholic moral theology for centuries. Thomas Lickona, writer of the influential Character Matters related character to the pattern of virtuous habits that Christians cultivate. These traits were generated by a survey of York Region residents by the Character Council as being the traits that were most desirable for York Region residents. Catholics have used the term, “virtue” rather than “Character traits” but the phrases are used synonymously. These traits have been placed in a circle to represent the community and the world. The community chose these values and this is the moral world we live in as Catholics. We follow Gaudium et Spes, the Second Vatican Council document in its encouragement for the Church to dialogue with the world particularly in areas that are in agreement with Church teachings. None of the character traits contradict Church teaching and in fact resonate with virtues found in scripture and tradition. The cross is the largest object on the poster. The vertical dimension of the cross shows the tradition of teaching on virtue starting with the Hebrew Scriptures, moving to the Christian Scriptures and finally, Church tradition. 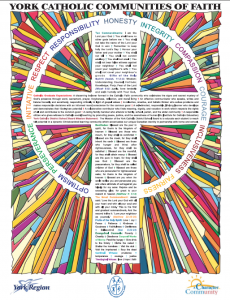 The horizontal aspect of the cross shows contemporary educational policy including the Ontario Catholic Graduate Expectations, and the YCDSB mission statement. These teachings on virtue show that the contemporary concern for Character education is deeply rooted in Catholic tradition and a significant part of our current practice. The stained glass is used to brighten the poster and make it more attractive to younger students. Stained glass is an art form associated with Churches and connotes the sacred dimension of who we are. The colours radiate out from the cross to emphasize that we have our source in the sacred. The random shards of glass show individual human imperfection or incompleteness but when put together in community can make a beautiful and holy design.